I have wanted to be a story teller since not long after I discovered that I liked to write poetry a over decade ago. I love listening to poets perform their poetry, like Michael Rosen, Simon Armitage or Ian McMillan. It really brings the poems to life, listening to them uniquely reciting their work. Simon Armitage talks about poetry being a form of dissent how it doesn’t and shouldn’t fit into the mainstream. I feel the same about pottery, that these aren’t things that are going to be accessed by everyone, not everyone will want to read pottery and not everyone will want to eat off handmade dinnerware, nor should they otherwise it wouldn’t be special. Thought unlike poetry it can be so hard to capture the story of a pottery. Talking to other potters on Instagram it is in the marks that the potters hand leaves behind, the forms they decide to produce, and the colours. The pots I buy tend to be off potters I know or have met a few times, so I can understand something about the maker and for me personally that adds to the associated story in my mind. When I tell the story of my pots it gets entangled with my story, with my anxiety, health, worries and insecurities. The intermingling of these things form something new, but with all three dimensional objects they really have to be held as you read the story to really take all the information in. Stefan Andersson has a really interesting video where he tells the story of each pot and an overview of his work runs throughout. He goes a little more into it on The Potters Cast, describing how he only finishes so many pots a year and destroys a lot of work, but does it all for the learning. The learning can then influence his teaching where he actually makes most of his money. 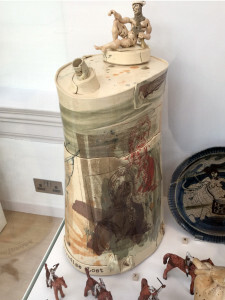 When I think of the traditional way of storytelling with pots I think of the Greeks or more recently artists like Stephen Dixon, Grayson Perry. Their work jammed packed with imagery, but I am not the best illustrator, and I really want to work with words too. 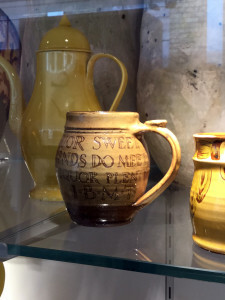 Puzzle jug in CoCA’s collection in the York Art Gallery. Then there is also pottery like puzzle jugs that have small poems, but the stories I want to tell are too big for such a small space. So then I would either have to make bigger pots or write in shorthand, I don’t know shorthand and don’t think the market for oversized pots is very big. Some days I feel like I want to produce a form of dissent against everything I know. This entry was posted in Making, storytelling and tagged ceramics, clay, Ian McMillan, Michael Rosen, poetry, Simon Armitage, story telling, storytelling. Bookmark the permalink.